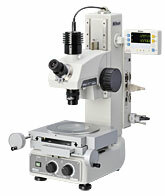 Nikon Corporation (President: Michio Kariya) is pleased to announce the launch of the new Measuring Microscope "MM-200" on April 1, 2009 (Launch on March 2, 2009 in Asian countries). This new design is compact and lightweight with an affordable price for all who require precision and accuracy for measuring a variety of metal, plastic, and electronic parts in all industries especially Automotive and Electronics industries. This new product is especially designed and engineered with the machining engineers and inspectors in mind. Nikon has provided the industries worldwide with the Measuring Microscope Series which have been long appreciated in the fields where highly accurate measurements is required for precision parts. Together with all the technologies and know-how inherited from Nikon' s Measuring Microscope Series, new design such as a built-in stage is reflected on the MM-200. Thanks to the built-in stage design, the MM-200 can offer not only lower price but also high accuracy which is the same as Nikon' s current MM400/800 models. In addition, its space-saving & compact design allows the instrument to be used right on the shop floor and the production site. No stage installation work is necessary and the footprint is reduced by 50% compared to the current MM series since the stage is built in the main body. The same traveling accuracy is obtained as the current MM400/800 series and still more lightweight, compact, and at a lower cost. No halogen bulb needs to be changed and light source running cost is reduced since both diascopic and episcopic illuminators employ high intensity white LED light source. Focusing motion control mechanics is newly designed to optimize the use of frequently used objective lenses from lX to l0X. The dedicated monocular optical head for the MM-200 is available for an immediate measurement on the eyepiece at the production site. The dedicated C-Mount Video Head (built-in reflected LED illuminator) allows for connecting with optional Data Processing Software E-MAX. The stage lead screw is sealed in order to protect the MM-200 from contamination generated from the adjacent machinery at the production area. The optional LED ring Lights will produce clear and enhanced edge contrast by oblique and 8-segmented individually ON/OFF lighting.